Everyone is invited to Edible Books 2009 with BEST! Every year on April 1st, the Edible Book festival is held in various locations around the world. Anyone can hold and event and register with the main organization (books2eat.com). Entries can be submitted any time before April 1st. Photos are starting to appear here in our Flickr group - where you can also upload your photos when your book is ready! I've been looking through some of online galleries from previous events and found a couple new favorites. Frankenstein is one of my favorite books already, and now it's also one of my favorite edible books! This is from the Loganberry Books website, their 2004 event. 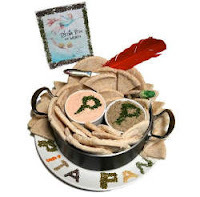 Pita Pan! Another great one. 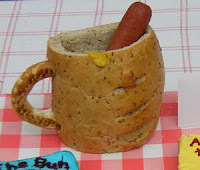 I found this example on the website for the Hong Kong edible book festival, from their 2007 event. What a brilliant idea....clever people. 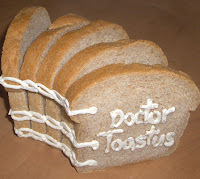 I'm excited about our own local installment of the Edible Book Festival. BookWorks, Asheville's book arts center (www.ashevillebookworks.com) is hosting the Festival on April 1st as well. Can't wait to see (and taste) what everyone comes up with! Wow, now this is a genius idea. I wonder if my Book Club would be open to doing this for April... :) Thanks for sharing, Rhonda!